The popularity of Bootstrap framework contributes to the popularity of Bootstrap admin template. With Bootstrap it is very easy to create responsive, highly customizable, attractive admin templates. There are a plenty of admin templates available that provide multiple functionalities that would be needed for a back-end application. There are free and premium admin template available on the internet, with some free admin templates as good as the premium ones. Admin templates undoubtedly save a lot of time and money, possibly thousands of dollars, when developing the back-end of a web application. You don’t need to start coding from scratch, and you wouldn’t need to worry if you are not a good designer and you can’t hire a designer. Most of the work for the user interface for your web application has been done. All you need to do is to select a template that is most suitable for your design, download it and then incorporate it into your project. If you are new to Bootstrap admin templates read Understanding bootstrap admin templates. 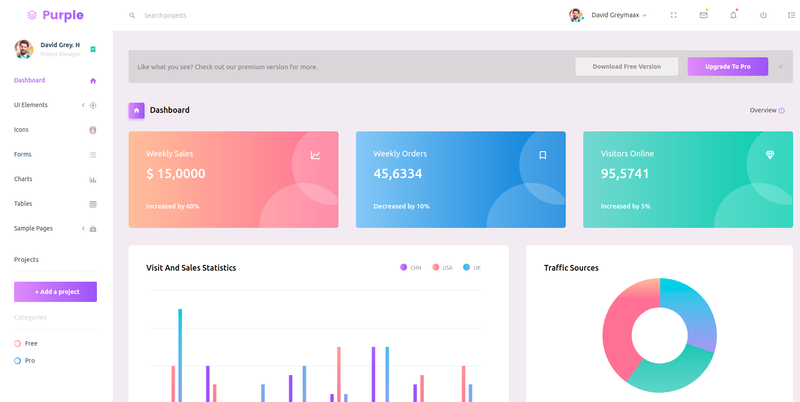 Below are some of the beautifully designed admin templates based on Bootstrap 4 that are completely free. Purple is an amazing admin template with very well designed interface implemented through a very well written code. Purple has a very modern design with neatly designed components. The design uses a mix of colors with gradients that make it one of a kind. The template comes with all the basic components needed in an admin template. It has got a powerful admin dashboard, basic UI elements including various types of buttons and template typography, icons, using Font Awesome, form elements to create beautiful elements. The charts using Chart.js and responsive Bootstrap tables can be used for data representation and organization. There are 5 sample HTML templates including a blank page, login page, register, 404 and 500 error pages. SB Admin is a free Bootstrap 4 admin template from Start Bootstrap. The template comes with 3 custom panel colors – red, yellow and green. It is responsive and comes with good features including the basic Bootstrap components, charts, widgets etc. Start Bootstrap provides support for issues through their help page. Also, there is a helpful discussion in the comment section on the website. Core UI is a free admin template built on top of Bootstrap 4 and it is fully responsive. It is built to support the most popular frameworks and libraries like Angular2, AngularJS, React.js, and Vue.js. An extensive documentation is provided on the website which has anything and everything about the components, technologies, code etc. that you need to know while setting up your admin panel. If there’s an issue in the template you can raise the issue through GitHub. Vali Admin is free admin template built with SASS, PUG.js, and the latest version of Bootstrap. The template has a minimalist design with more emphasis on the functionalities. It has got an amazing admin dashboard and powerful Bootstrap components. These components are also extended using many third-party plugins. Apart from a great collection of basic UI elements like charts, forms, tables, Bootstrap elements, Icons, etc. the template has very well designed page templates which includes a blank page, log in, lock-screen, user page, invoice page, calendar, a mailbox, and an error page.